Note: This is a collection of resources and guidelines for a challenge organized by the faculty of Charlotte Country Day School. It’s being shared with Agenda readers, unedited, for those who want to follow along. Learn more about diversity programming at Charlotte Country Day School here. “Have you ever made a successful change in your life? Perhaps you wanted to exercise more, eat less, or change jobs? Think about the time and attention you dedicated to the process. A lot, right? Change is hard. Creating effective social justice habits, particularly those dealing with issues of power, privilege and leadership is like any lifestyle change. Let’s get started! Who’s in? For 21 days (from January 17-Feb 17), you will choose ONE thing to do to further your knowledge of diversity, equity, inclusion and justice work. Below you will find prompts and reflections, as well as a list of resources. Each day, simply choose ONE article, comic, video, chapter from a book, movie, song, etc. to experience and then take a few minutes to reflect on that experience in your journal. If you want a more scaffolded approach, use the prompts/reflections below to guide you through some of the days. For a less scaffolded approach, choose any of the following resources to experience or dig up some of your own. As with all work, you will get out of this what you put in. So, set your intentions to yourself clearly each day, embrace discomfort and enjoy learning and growing. PROMPTS AND REFLECTIONS (for a more scaffolded approach). Many of these resources/questions have been compiled from Food Solutions New England’s work and the work of Dr. Eddie Moore, Jr. and Debby Irving. Reflect on why you signed up for the 21 Day Equity Challenge. What are you hoping to get out of this experience? How do you hope this work will change the way you view your work and this world? 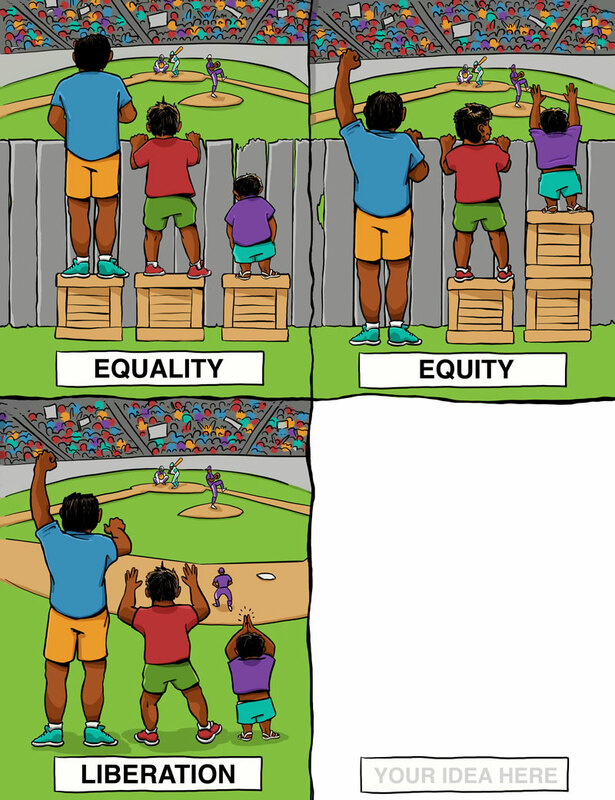 Read “The Problem with that Equity/Equality Graphic” and look at the various visuals under comics/visuals in the resource section. 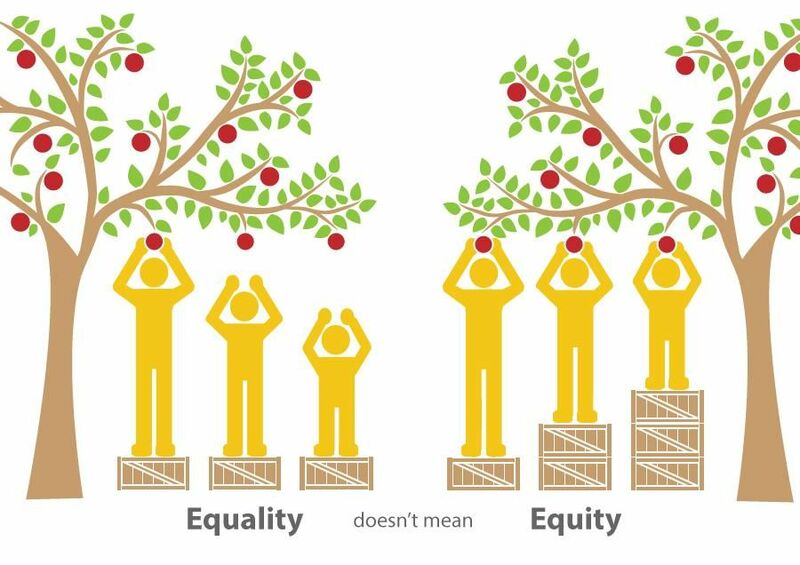 As you think about addressing “isms” in your practice, are you thinking more in terms of equality (everyone getting the same) or equity (everyone getting what they need to succeed). How might a shift towards equity make a difference in your practice? Listen to Jay Smooth’s “How I Learned to Stop Worrying and Love Discussing Race.” How comfortable are you talking about race and racism with family and friends? How comfortable are you talking about race with those with whom you work? What is the impact of this? How might you you become more comfortable with this work and lean into the discomfort? Spend some time observing social interactions today– in your personal life, in a class or in your workplace. Whose voices tend to be the loudest? Whose voices tend to be ignored? Who seems to have the most power/clout to shape agendas? What are the patterns you noted? What does this make you think? Spend some time observing the physical space in your workplace, your child’s classroom or a public space. Who is obviously represented and welcome in the space? Who is left out? Watch Jay Smooth talk about 4 Levels of Racism. How does looking at “isms” as a system problem versus just a personal moral failing change the way you view the work? What systems need examining in our community? What are some things we should be looking at? Watch the “gorilla selective attention” video. The clips show that we tend to see only what we expect to see. Stereotypes operate in a similarly blinding way in forming implicit biases, and can keep us from accurately perceiving situations and people. What does it mean that our brains have “mindbugs” like this? What are some times in our own life where these implicit biases have led you astray? First, make sure you’ve read up on Implicit Bias. Then, challenge yourself to take one of the Implicit Association Tests from Harvard. What did you learn about yourself? How do your biases sometimes show up in your work? How does knowing these things about yourself impact your practice? Read this short article on ways to overcome implicit bias. What might you try in your own life? Read the article on Microinclusions. What are 5 intentional practices you can do THIS week to make someone feel more included and known in our community. Write down what you do. Choose a few songs off the social justice playlist to listen to. How did they move you? How did they inspire you? How might you use music or art to inspire social change? Look at the Wealth Inequality Infographics. What surprised you about the infographics? What challenged you? 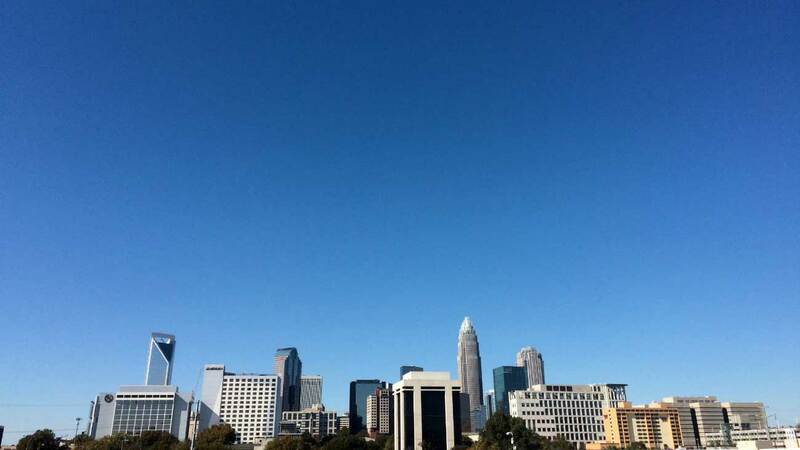 Charlotte was recently named one of the worst cities for social mobility in the nation. What does this mean for our school? Our work? Read Unpacking the Invisible Knapsack, Peggy McIntyre. Take a few minutes to self assess your own life. How has your own race benefitted you or not? How might this play out for in your personal life? Professional life? Watch A Trip to the Grocery Store. What are the roles of allies in our justice/equity work? What groups can you be an ally for (think about race, gender, religion, sexuality)? What are some concrete things you can do within our own community to be an ally to underrepresented groups? Take a look at the “I Too Am Harvard Tumblr” page and do some quick readings about microaggressions. Then, take the next week or so to listen carefully to conversations in your workplace and/or conversations in your outside-of-work life. Collect examples of microaggressions that you hear. Watch the Racism is Real short video. What surprised you? How does your own race (or that of a close family member) play out in your daily life? In spite of greater tolerance/acceptance and knowledge about human sexuality, LBGTQ children are still known to suffer from much higher rates of bullying, depression, anxiety and suicide. Check out these LBGTQ Bullying Statistics. How do we make our community a safe place for everyone? What shifts/changes should we consider? Watch The Doll Test. From an early age, children associate “dark skin” with “bad” and “light skin” with “good.” Where might these cultural messages be coming from? Take time this week to listen to media/news, etc. with this critical lens. How are whites portrayed? People of color? One of the groups facing the most overt discrimination in the US currently are Muslim Americans. Watch Meet A Muslim. How much do you know about the Muslim population in the US? How much do you know about Islam? How might you expand your knowledge base and understanding? Reflect on this experience. What are your biggest take aways for you? What has moved you? How have you changed as a result of this work? Why Do We teach Girls That It’s Cute To be Scared? 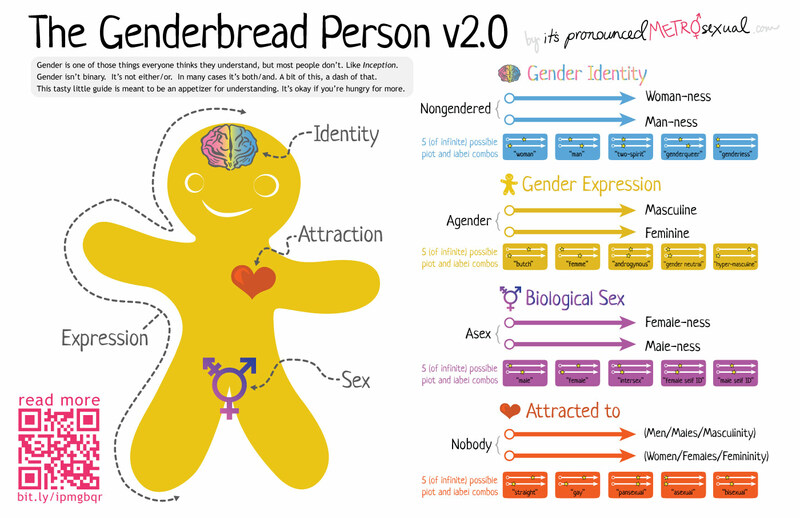 People with a History: An Online Guide to Lesbian, Gay, Bisexual, and Trans* History. Yusor Abu-Salha–one of the victims of the February 10, 2015 shooting in Chapel Hill, North Carolina–recorded a StoryCorps interview with Mussarut Jabeen.